A conflict of interest (COI) occurs when a person serves or represents two distinct entities or persons and must choose between two conflicting interests or loyalties. A University employee has a conflict when his/her outside activity or financial interest could potentially interfere with their professional obligations to the University. and business activities including managerial positions. Such activities should be reported and approved by the University before beginning the activity. All financial interests, including but not limited to, stock, cash and LLC. interests in an entity that does business with the University should also be reported and approved by the University. Outside activities that represent time commitments that could interfere with an employee accomplishing his/her University duties. Outside activities using University equipment, personnel, or resources. Outside activities where students supervised by the employee are involved. Outside activities or financial interests in an entity that supports the faculty or staff member’s research activities at the University. However, this excludes stocks that are in a mutual or retirement fund managed by an independent third party. Outside activities (consulting, employment, management, etc.) with a person or entity, or financial interests in an entity, that does business with the University. The University Conflict of Interest (COI) policy contains a description of what is a COI under the Code of Ethics, which is set forth in the Florida Statutes. The policy discusses how to obtain a COI exemption from the Code for Research and license agreements. The policy also describes the Public Health Service (PHS) and National Science Foundation (NSF) regulations concerning research and COI compliance requirements. COI records are to be retained 3 years from completion of the research that pertains to the project with the conflict or 3 years from the end of the license agreement that is the subject of the conflict. The Public Health Service (PHS) published a new Financial Conflict of Interest (FCOI) Regulation which takes effect on August 24, 2012. One component of the regulation is that the University post on a public web page information concerning investigators on a PHS funded project who have a FCOI. The required information is listed below. The information provided is current as of the date listed and is subject to updates, on at least an annual basis and within 60 days of the University identification of a new FCOI. University of Florida employees and scientists may collaborate with companies to help develop scientific and medical breakthroughs or to provide expertise. As leaders in their fields, UF scientists are often sought after by companies. To assure professional and commercial integrity in such matters, UF reviews these collaborations and, when appropriate, puts measures in place to minimize bias that may result from ties to companies. David Reisman 8/24/2012 Principal Investigator Zenagene Stock The interest is one whose value cannot be readily determined through reference to public prices or other reasonable measures of fair market value. The interest is one whose value cannot be readily determined through reference to public prices or other reasonable measures of fair market value. Sergei Zolotuhkin Co-Investigator Lacerta Therapeutics, Inc. Stock, Co-Founder/Member of the Board The interest is one whose value cannot be readily determined through reference to public prices or other reasonable measures of fair market value. Ronald Mandel Co-Investigator Lacerta Therapeutics, Inc. Stock The interest is one whose value cannot be readily determined through reference to public prices or other reasonable measures of fair market value. 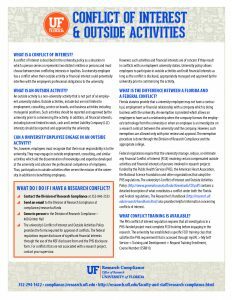 The Public Health Service (PHS) Conflict of Interest (COI) regulation requires Principal Investigators and all Key Personnel in PHS-funded projects to complete the Financial Conflict of Interest (FCOI) training before engaging in the research. UF has established a specific FCOI training course DSR 810, which satisfies this PHS requirement. This course can be accessed through myUFL > My Self Service > Training and Development > MyTraining. Every Public Health Service (PHS) and National Science Foundation (NSF) grant application submitted to Division of Sponsored Programs (DSP) requires completed PHS and NSF Disclosure of Significant Financial Interest (SFI) forms. These forms are for internal review only, and they are not submitted to the sponsor. PHS Significant Financial Interest Disclosure Form (PDF): Required when UF will be the recipient or a sub-recipient of funding from a US Public Health Service Organization (HHS, PHS, NIH, HRSA, FDA, SAMSA, AHRQ, CDC, CMS). This form is also used with non-federal sponsors that adopt the PHS FCOI policy, for example, American Heart, FDOH/Bankhead Coley, Alliance for Lupus Research (ALR), American Cancer Society (ACS), American Heart Association (AHA), Arthritis Foundation (AF), Juvenile Diabetes Research Foundation (JDRF), Lupus Foundation of America (LFA), and Susan G. Komen for the Cure American Lung Association. NSF Significant Financial Interest Disclosure Form (PDF): Required when UF will be the recipient or a sub-recipient of funding from the National Science Foundation (NSF). USAMRMC or CDMRP Financial Interest Disclosure Form (PDF): The Congressionally Directed Medical Research Programs (CDMRP) and the United States Army Medical Research and Materiel Command (USAMRMC) is required with each grant application where UF will be the recipient or a sub-recipient of funding from the United States Army Medical Research and Materiel Command (USAMRMA) or from the Congressionally Directed Medical Research Program (CDMRP). What do I do if I think I may have a research conflict? Note the University’s Conflict of Interest and Outside Activities Policy provides the forms required for conflict approval. For non-research conflicts, contact your college. Why does the university care about conflicts and outside activities? Faculty and staff must recognize their main responsibility is to the University. They may engage in outside employment, consulting, and similar activities that spread knowledge and expertise developed at the University and advance the professional competence of faculty and staff. Thus, participating in outside activities often both serve the University’s mission and benefit employees. However, if such activities and financial interests conflict with an employee’s University duties, then they can become a concern. University policy allows faculty and staff to participate in outside activities and hold financial interests as long as they do not conflict with their duties. What are the regulatory agencies responsible? University employees are subject to the Code of Ethics, which is set forth in the Florida Statutes. The Code of Ethics restricts activities of University employees, including when an employee has a relationship with a company that is doing business with the University. University employees, who are investigators on Public Health Services (PHS and those agencies adopting PHS) and National Science Foundation (NSF) federal projects, are subject to the PHS and NSF COI regulations. What’s the difference between a Florida and federal conflict, and what are exemptions? Florida statutes do not allow a University employee to have a contractual, employment or financial relationship with a company that is doing business with the University. When the company licenses the employee’s technology from the University, or when an employee is an investigator on a research contract between the University and the company. However, such Exemptions are allowed only with prior review and approval. The Exemption procedure is done through the Division of Research Compliance and the appropriate college. Federal regulations require the University to manage, reduce, or eliminate any Financial Conflict of Interest (FCOI) involving certain compensated outside activities and financial interests of persons involved in research projects funded by the Public Health Service (PHS), the American Heart Association (AHA), the National Science Foundation (NSF) and organizations that adopt the PHS regulations. 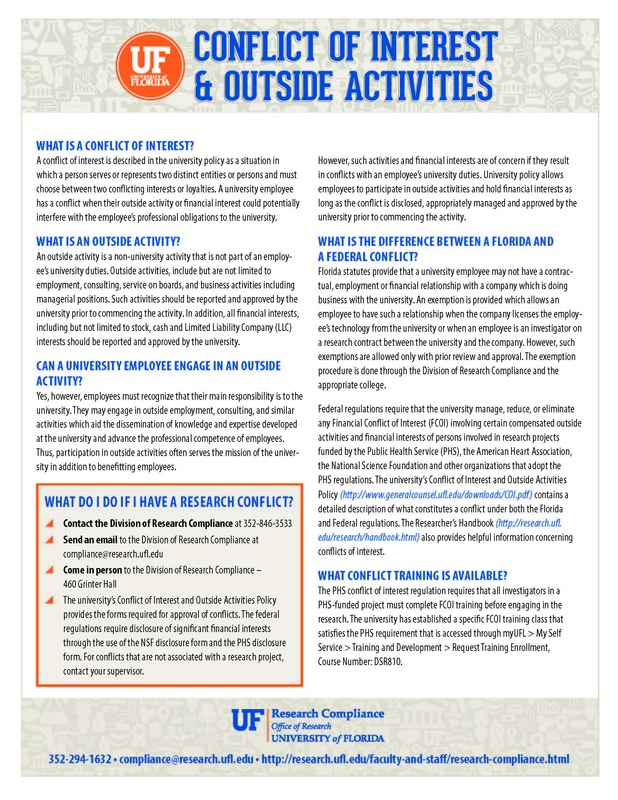 The University’s Conflict of Interest and Outside Activities Policy contains a detailed description of what is considered a conflict under both the Florida statute and Federal regulations. The Researcher’s Handbook also provides helpful information concerning conflicts of interest. What is a supervisory conflict? A University employee or student cannot have a relationship with a company if their supervisor also has a relationship with the same company. However, an exception may be allowed if the University student or employee is a co-inventor or co-contributor to the intellectual property. What is the university policy on conflicts and human subjects research? The degree of risk to human subjects inherent in the research. The nature of the institutional and additional individual conflicts of interest and the degree to which the conflict(s) can be effectively managed. Whether the University is uniquely qualified, by virtue of distinctive resources (e.g. special facilities or equipment that cannot be duplicated easily, unique patient population) and/or the unique experience and expertise of its investigators, to conduct the research and appropriately safeguard the welfare of the human research participants involved. The number of trial centers, the clinical trial phase and role of the University in the case of human subject clinical trials. Can a conflicted person be involved in a subcontract to their company? If a person has a relationship with a company and is a research investigator for the University, then significant conflict issues exist. The person would have to justify why there needed to be a subcontract to their company. Some conflict issues that arise are confidentiality of information, bias and intellectual property issues. What is a conflict management plan, and why is it needed? Conflicts of interest are common in research, especially in light of the increased support of University-industry collaboration. Conflicts of interest are not inherently bad and can exist as long as they protect the integrity of the research. A management plan establishes conditions needed to ensure the design, conduct or reporting of research that is not directly and significantly affected by any investigator’s financial conflict of interest. The management plan also protects students and postdoctoral fellows from inappropriate pressures and protects intellectual property rights. What are possible management plan conditions? Severing relationships that create actual or potential conflicts. What happens if I do not comply with UF’s Conflict of Interest Policy? Non-compliance is addressed under applicable policies. Research study review will be delayed when there is a failure to file a Research-Related Financial Interest Disclosure form by any investigators responsible for the design, conduct or reporting of PHS and NSF projects. Such proposals will not be submitted until all investigators have completed disclosure forms. Also, award funds will not be released until all investigators with a conflict have that conflict approved.